Sorry, not sorry, but the whole normcore look just isn’t for everyone. Introducing the latest throwback trend that will make you want to raid your granny’s jewelry box. (‘Cause our obsession with granny-chic engagement rings and granny heels clearly wasn’t enough.) Delicate layered necklaces and minimalist stacked rings, step aside: This season, we’re all about vintage-inspired jewels that make us feel fancy AF. 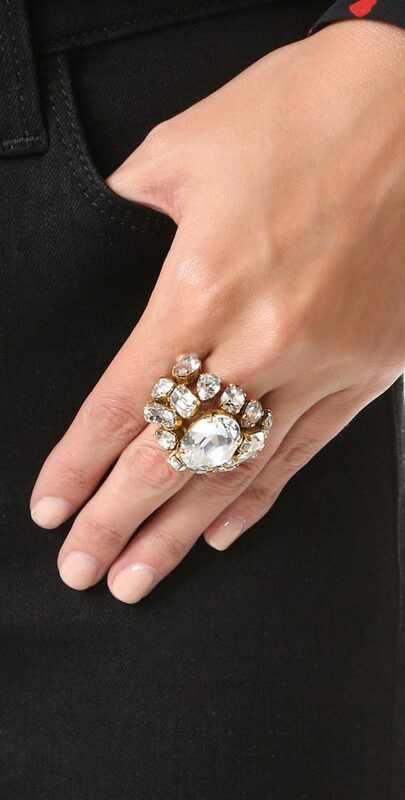 Think: glitzy cocktail rings, bejeweled brooches and soiree-ready pearls guaranteed to lend major drama to every impeccably styled getup from here on out. Don’t fret if prim and proper isn’t your thing-we’ve compiled 22 granny-chic baubles with a contemporary twist that even modern-day #girlbosses will want to snag. Remember, more = more. 1. Kate Spade Trellis Blooms Large Brooch : It’s true what they say: Granny always knows best. 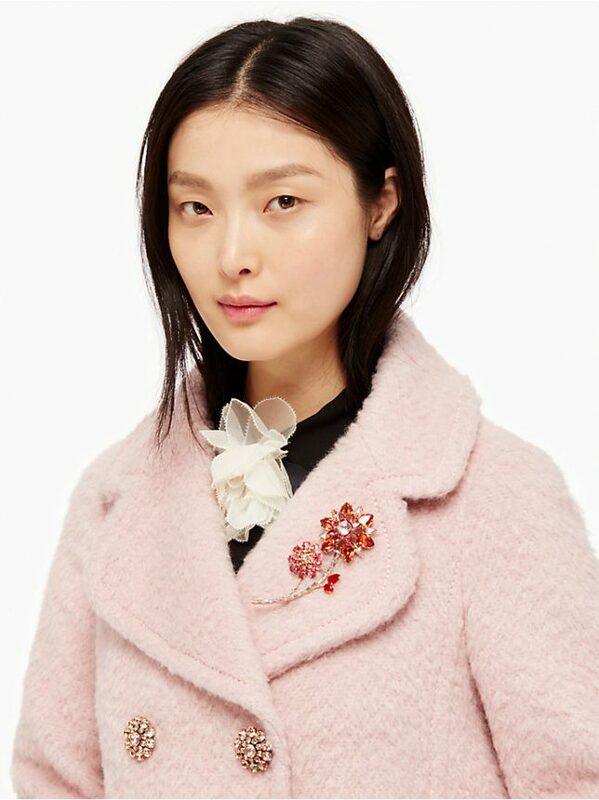 Once the temps dip low, don’t hesitate to accessorize your favorite wool cocoon coat or fuzzy topper with this lovely pink Swarovski floral brooch. Bonus points if you swipe on a matching red lippy. 2. 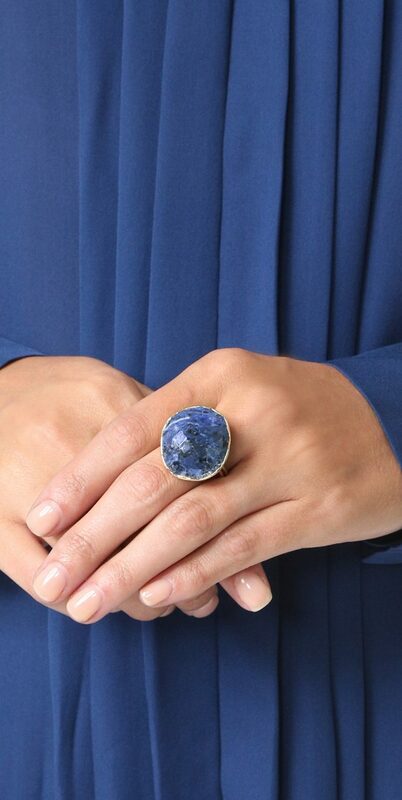 Nakamol Abby Ring: In lieu of overly fancy diamonds that always seem more appropriate for after-hours, slip on this lapis lazuli ring with major IRL potential- AKA, it won’t look out of place styled with a chambray shirt dress and suede ankle booties. Running errands has never looked so chic. 3. 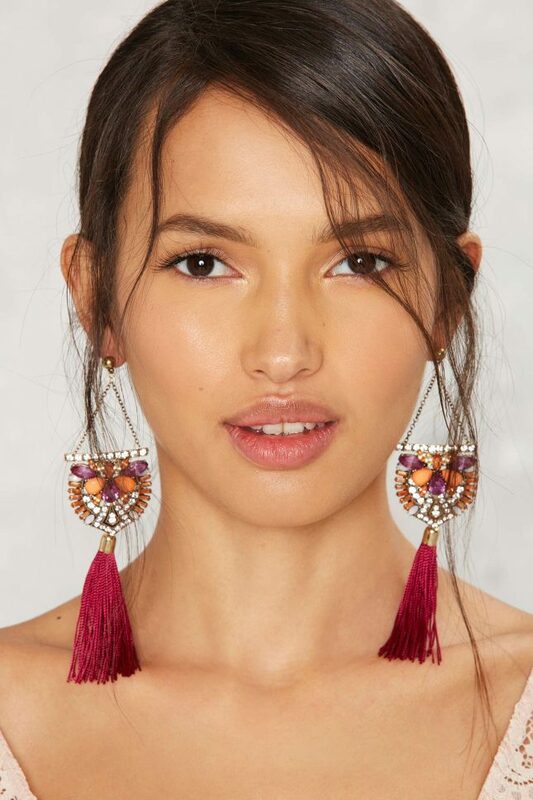 Nasty Gal Margaux Tassel Earrings : If your grammie taught you anything, it’s to embrace your often over-the-top sensibilities. Whether you pair these next-level burgundy tassel earrings with a plain white tee or a boho maxi, you’re guaranteed to make an entrance. DO complement the purple and orange gems with an off-the-shoulder silhouette and a sultry updo for a night on the town. 4. Erickson Beamon River Song Ring: Show us the bling! Who needs a Neil Lane engagement ring when you can sport a cluster of Swarovski crystals on your finger? Just sayin’. 5. BaubleBar Halsey Asymmetrical Ear Crawler Set : If it’s good enough for Shay Mitchell, then it’s more than good enough for us. As a matter of fact, this emerald ear crawler set was inspired by Shay’s grandmother’s jewelry collection. Pair these glitzy jewels with anything from a metallic bomber jacket to a marled sweater for all the style points this season. 6. Ann Taylor Crystal Cluster Chandelier Earrings : Take an outfit from zero to 100 like that a la these eye-catching crystal chandelier earrings that demand attention. Whether you style them with a streamlined jumpsuit for the boardroom or keep things on the DL with a suede pinafore dress and a collared blouse, you can’t go wrong. 7. 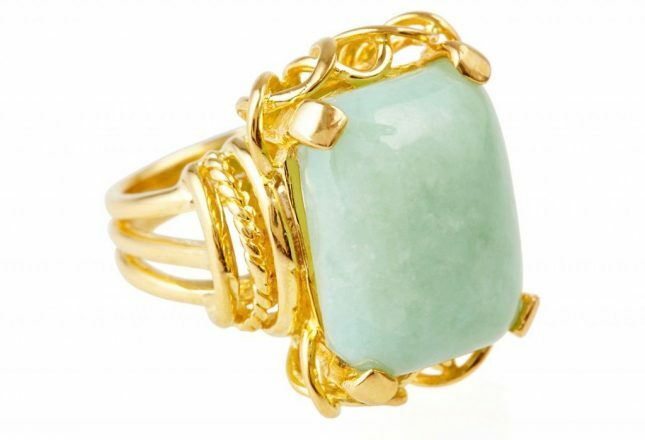 Suz Somersall Gold Jade Bell Epoque Ring: Fake it ‘til you make it with this vintage-inspired ring that looks like a family heirloom. Just between you and us, it could totally pass as your great grandma’s wedding ring. Team it with a lace frock for a wedding in the countryside, or dial things down with a fisherman sweater and herringbone blazer. 8. 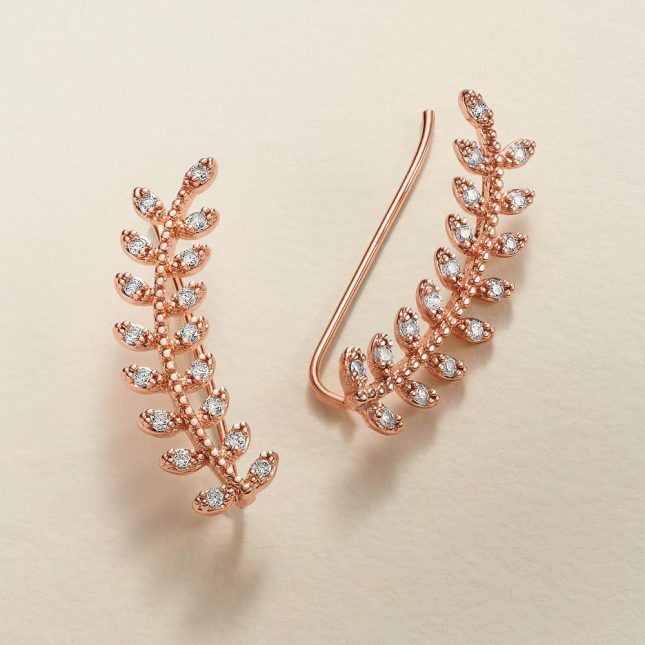 LC Lauren Conrad Runway Collection Branch Ear Climbers : These bedazzling ear climbers are not only easy on the wallet, but they’re guaranteed to add major bling to a floor-grazing gown or sleek jumpsuit. Come date night, they can just as easily be teamed with a silk blouse, high-waisted bell bottoms and throwback clogs. Your move. 9. 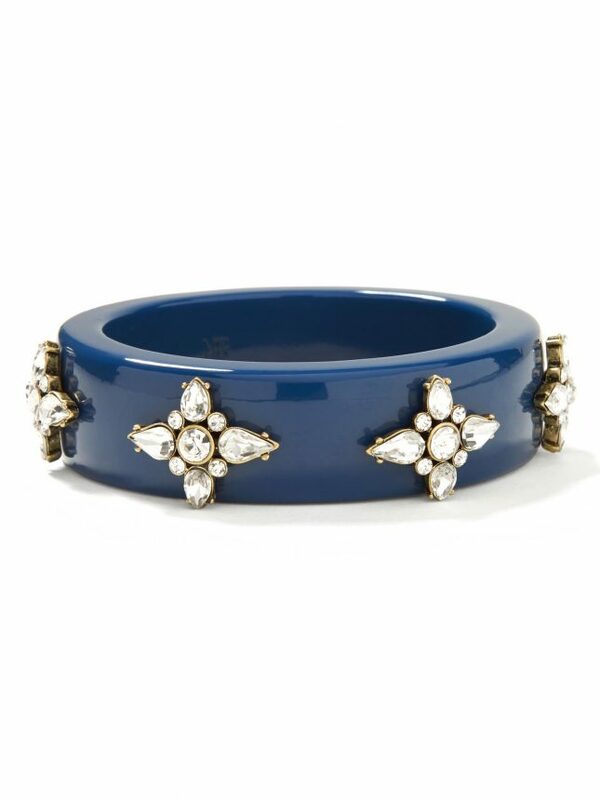 J.Crew Enamel Ring : Have a slew of upcoming holiday parties in your iCal, will invest in this fun enamel cocktail ring for a hint of old-time glamour. Not only will this fab ring look DDG when you’re sipping rosé, but it’s guaranteed to keep the compliments coming all night. 10. 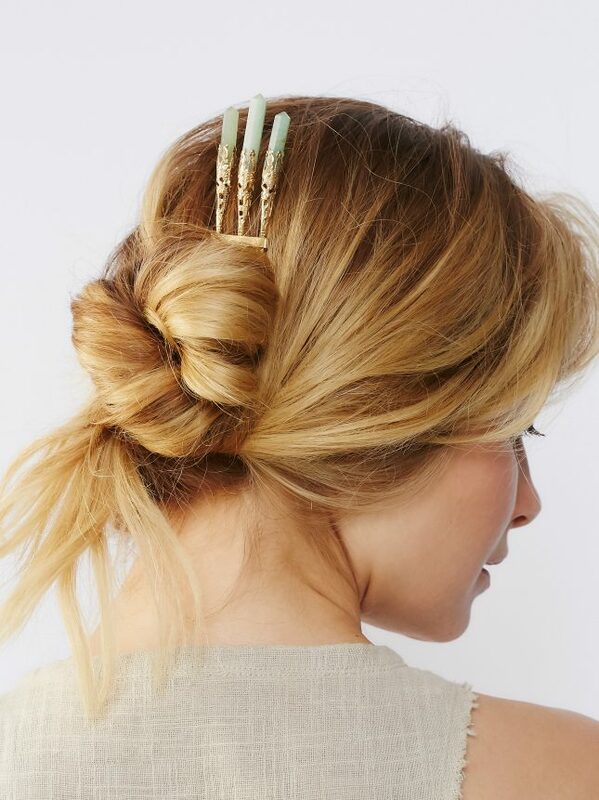 Free People Timeless Crystal Comb : Modern brides and bridesmaids, unite! We’re low-key obsessed with this timeless crystal comb with art deco influence. Use it to dress up a chignon or add an ethereal touch to an airy maxi for a fall wedding, black tie reception -you name it. 11. Julie Vos Penelope Open Bangle : Do your granny proud by styling this elegant pearl bangle, featuring a sweet petal accent, alongside your favorite vintage Cartier watch. The juxtaposition between old and new will never go out of style, especially with an LBD and chunky block heels in tow. 12. 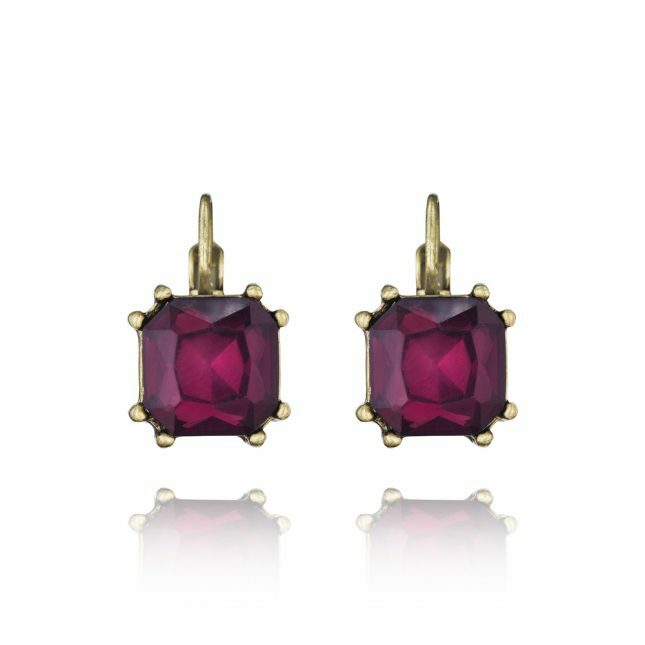 Chloe + Isabel Color Code Plum Drop Earrings : Rest assured you don’t have to be attending any fancy soirees to slip on a pair of these plum drop earrings. They’ll take you from pumpkin picking to sampling apple ciders at the vineyard - and serve as a subtle pop of color to your favorite mustard yellow sweater. 12. 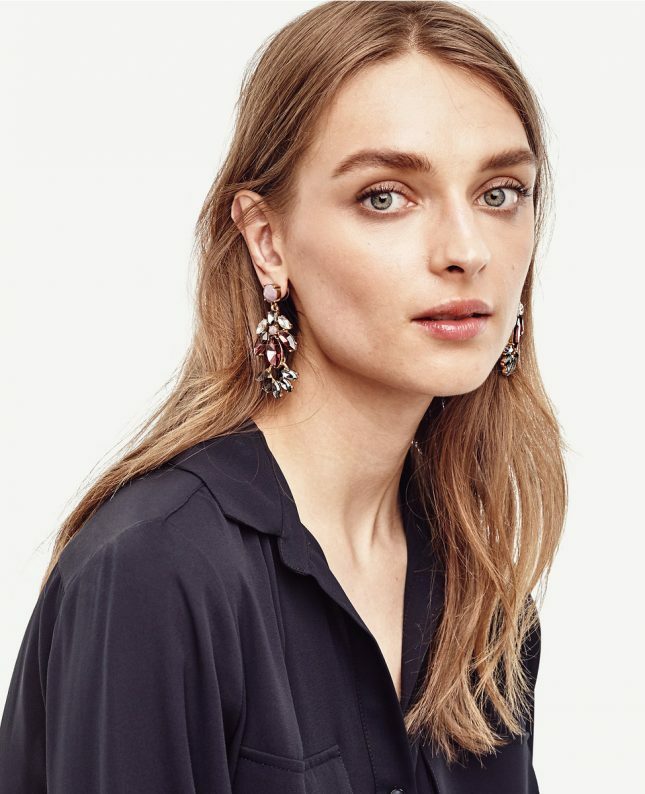 Chloe + Isabel Color Code Plum Drop Earrings : Rest assured you don’t have to be attending any fancy soirees to slip on a pair of these plum drop earrings. They’ll take you from pumpkin picking to sampling apple ciders at the vineyard- and serve as a subtle pop of color to your favorite mustard yellow sweater. 14. 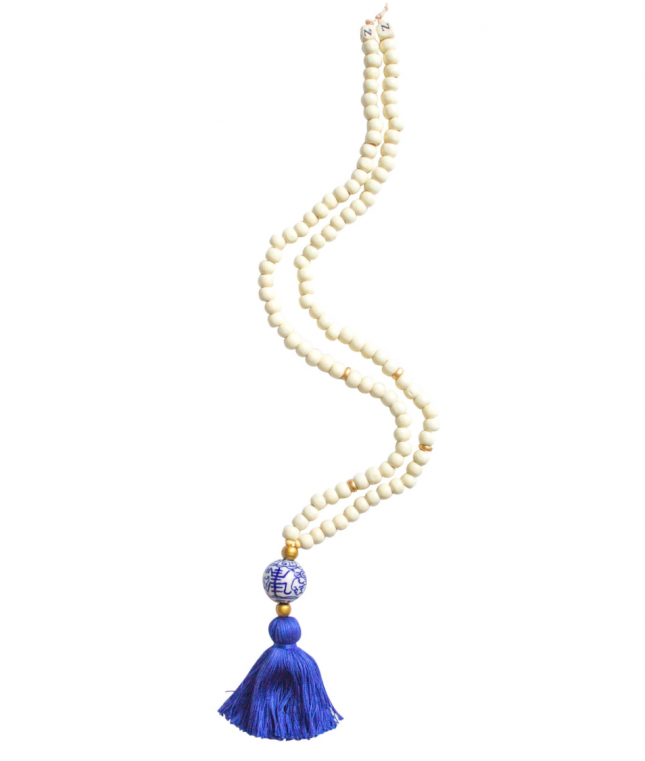 Design Darling Cricket Blue Tassel Necklace : For the hostess with the mostess, we wouldn’t expect anything less. More preppy, less boho, this gorgeous cobalt blue tassel necklace will dress up any white blouse or Breton-striped top for a polished look. 15. 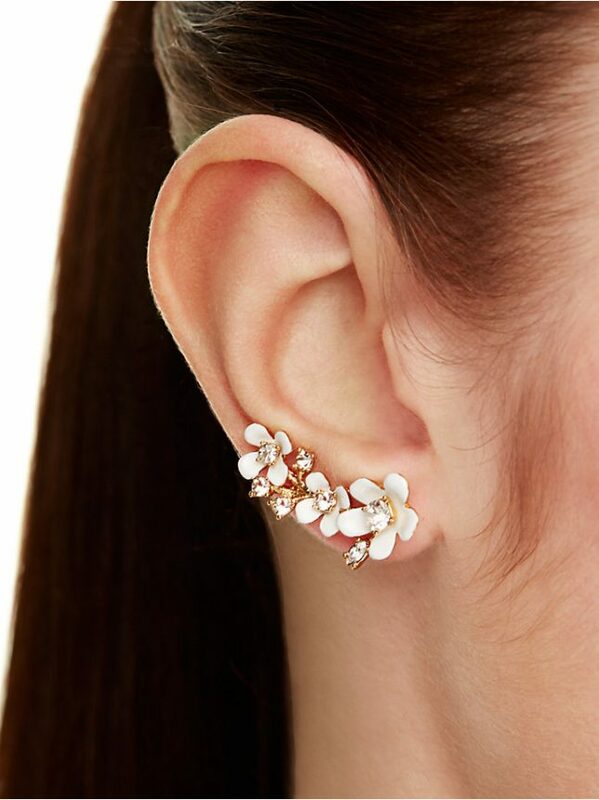 Kate Spade Pretty Petals Ear Pin: Pretty is an understatement. These floral beauties won’t cramp your style one bit, especially when styled with a Peter Pan collar dress or a scalloped lace blouse. The ear crawler style can double for day and night -it’s that foolproof. 16. Banana Republic Treasure Trove Resin Bangle : Blasé outfits simply don’t exist when you have a sparkly resin bangle with this much look-at-me appeal. 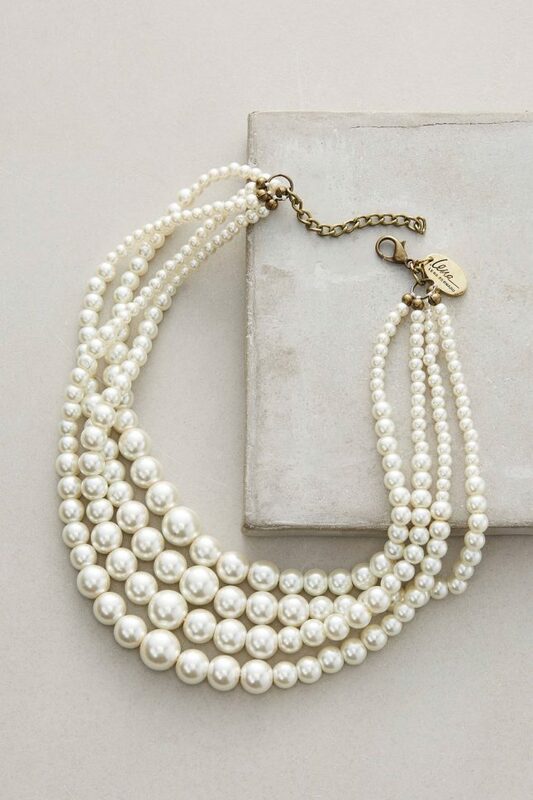 Proceed to toss this bad boy on with a strand of pearls and a pencil skirt for a look that’s boss. 17. 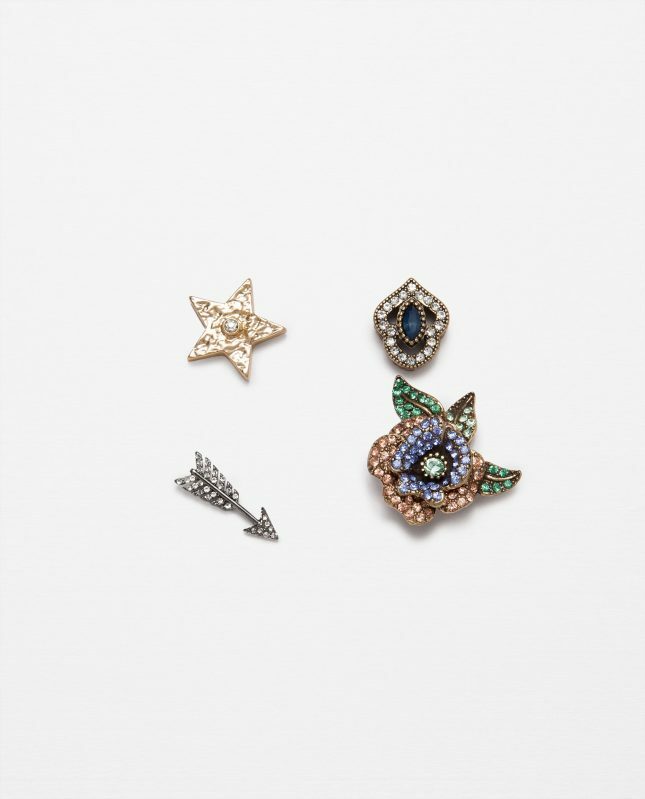 Zara Shiny Badge Pack : What better way to add swag to your silk bomber jacket than with a few well-placed rhinestone-embellished pins? Come after-hours, these stunners will look DGG fastened to a smoking blazer and drop waist dress - you know, for a little extra flapper flair. 18. 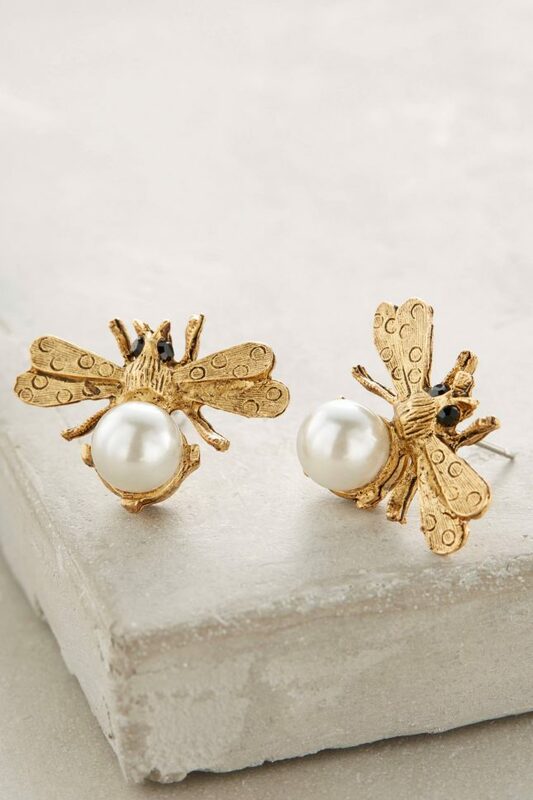 Miss Ellie Melitta Posts : While insects wouldn’t normally pique our interest in the jewelry department, there’s something downright charming about these pearl firefly earrings. They’re understated enough to wear for a class presentation, yet still luxe enough to pass for a bridal shower-turned-garden party. 19. 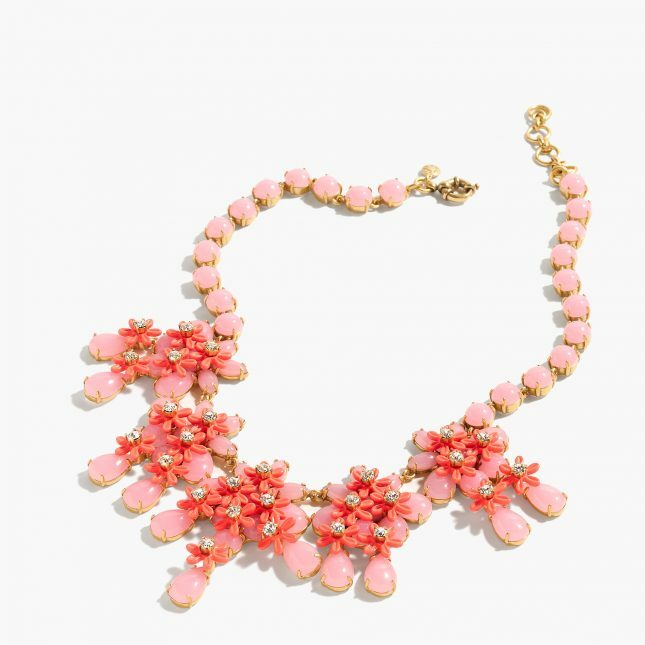 J.Crew Floral Cascade Necklace : A surefire way to inject some color play into your nine-to-five wardrobe? Feast your eyes upon this swoon-inducing floral statement necklace that exudes sophistication and class. Keep all eyes on you by styling it with a chartreuse shift dress or a blush pink blazer. 20. 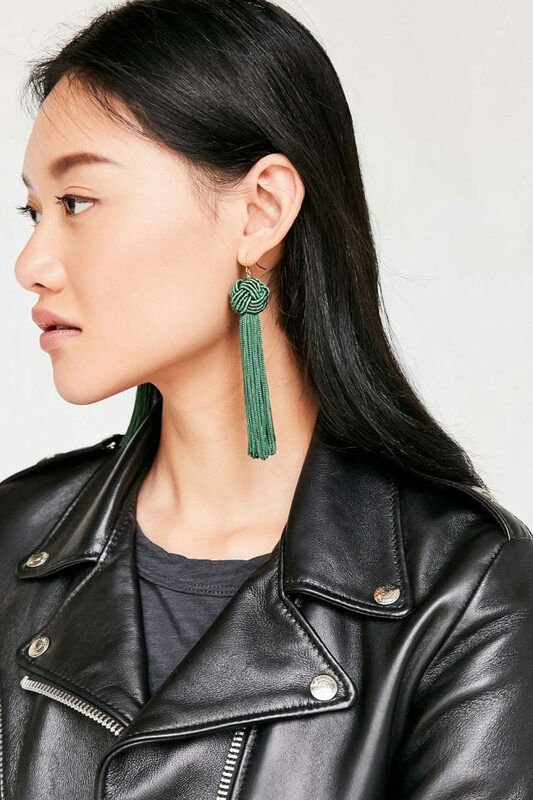 Vanessa Mooney Astrid Knotted Tassel Earring : Part glam, part tough-girl-in-training, these knotted green tassel earrings were made for a GNO or bachelorette party. Take style cues from your favorite It-girl by tossing ‘em on alongside a leather moto jacket, a lingerie-style slip dress and pointed-toe ankle booties for an off-duty look that’s so RN.